January and February are particularly popular times to detox, as we all attempt to make amends to our bodies for the punishment they’ve taken over the Christmas period. Given the state of the economy, your body might not be the only thing that’s not in great shape. Even if your finances are looking less than healthy, there are plenty of ways you can try a detox diet without breaking the bank. Buy organic produce. Yes, organic food does cost a little more, but there’s little point doing a detox if you continue to consume the very toxins you’re trying to eliminate. Fortunately, by leaving out the foods that a detox bans, your supermarket shop will be much cheaper. Without the likes of processed foods, ready meals, and alcohol you’ll notice a big difference at the checkout, meaning you can afford to spend a little extra on the good stuff. Buy detox supplements. There’s little evidence that they work, and they can be very expensive, and even bad for us. Many products claim to aid natural detox processes, but if you’re on a budget or just don’t have the time to research these products, don’t worry. By eating fresh, natural and whole foods and drinking sufficient water, you’ll be doing your body a big favour, no additional ingredients required. Many people supplement their detox diets with treatments, such as massage or colonic hydrotherapy. If you’re trying to keep costs down, simply skip this step and invest the money you have in your diet. While treatments are great for relaxation, there’s little scientific evidence that they assist the body with detoxification; and any mental benefits will quickly wear off if you are worried about the price. Getting out in the fresh air and breathing deeply are excellent, free ways to get your system moving. Well, alright, don’t steal, but for the purposes of making healthy and nutritious smoothies and juices, borrowing a blender is a great idea. Unless you think you’ll use it all the time, there’s no point spending money on a new gadget. If you do want to buy your own, go for a cheap model – it’s not necessary to buy the most expensive brand in the shop. Alternatively, if you already have a food processor, use that. If your usual supermarket is one of the more expensive chains, why not trade down a brand for your detox shopping? Even the budget stores now sell organic produce and good, fresh foods. This is a great way to save all year round, even if you are reluctant to divert away from your usual store. If you’re an online supermarket shopper, check delivery charges as well as food costs. The fruits you might use to make smoothies and juices can be bought frozen very cheaply. 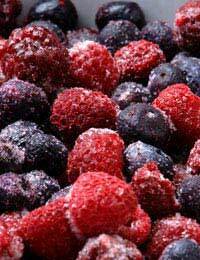 Frozen fruit and vegetables can also contain more nutrients that so-called fresh foods that have travelled a long way before reaching your supermarket. Don’t overlook the freezer section during your detox. During a detox, shopping around for the best quality food at the best prices is part of the fun! You might even form some lifelong money saving habits along the way.